This intimate all-butler resort of just 74 oceanview suites is tucked into a magnificent coral bluff. Each suite features exquisite original furnishings and impressive designs that make the most of the breathtaking views of the Caribbean Sea. Oversized balconies and patios feature elegant bistro sets and your personal butler is always on hand to cater to your ever need. Villa Plantana is a private three-bedroom villa that sits above the resort's quiet east beach amidst lush tropical foliage. Featuring its own pool, personal butler service and sumptuous decor, Villa Plantana guests enjoy the best of both worlds with all the resort’s amenities, restaurants and services just steps away. 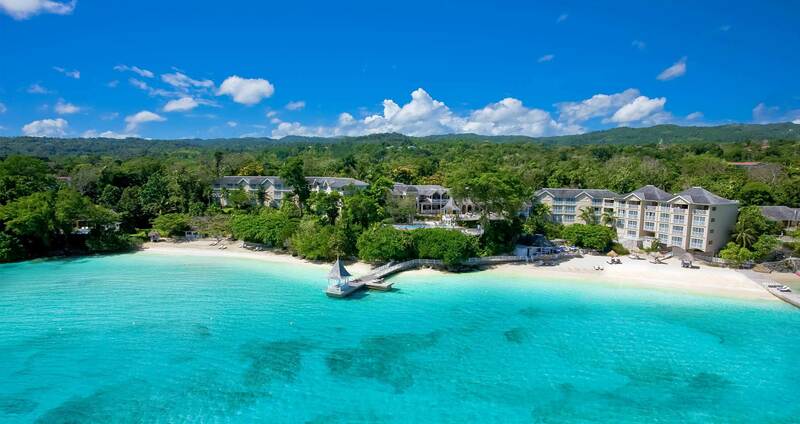 Boasting two of Jamaica's most extraordinary beaches, follow natural coral stone steps to the resort's West Beach, a tranquil spot to bask in the warmth of the Caribbean sunshine, or lounge in the shade of tiki huts on an indulgent canopied bed-on-a-beach. The East Beach is protected by offshore coral reefs that make these waters the calmest in Jamaica-ideal for every type of water sport. Sandals Royal Plantation offers tantalizing temptations from French cuisine to Caribbean favorites and authentic pub fare. Impeccable service, mouthwatering internatinoal cuisine, and a romantic atmosphere are found everywhere. Unlimited premium spirits are included 24/7 and served everywhere throughout the resort. We have designed the bars exactly where they should be right on the beach and directly over the ocean to give you a truly authentic island experience. We’ve even created bars inside our beachfront pools. Grown in Jamaica's misty Blue Mountain range, Jamaica Blue Mountain's coffee possesses an unmatched superior flavor and it's included throughout all our specialty restaurants, French-style cafes, Lounges, self-serve coffee stations, and indulging room service. Scuba diving at Sandals truly offers you the very best in equipment, staff and unbelievable dive sites all included! From regulators, BCD's, masks, snorkels, fins and tanks to state-of-the-art, twin diesel Newton boats and expert guidance from our PADI® certified dive professionals we’ve taken care of everything. 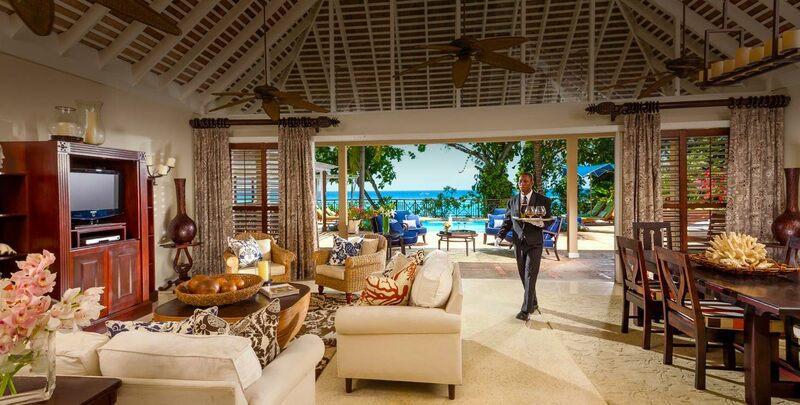 Sandals Royal Plantation is an intimate all-butler resort. Your personal butler is trained in accordance to the exacting standards of the Guild of Professional English Butlers, and provides a supreme standard of service and luxury where your every need is anticipated. When you tie the knot at Sandals, you get a Free Wedding. Our Free Wedding has everything you need to celebrate your special day with elegance and simplicity. It's the perfect start to the perfect marriage. And after you've exchanged your vows, you can begin your happily-ever-after with endless ways to enjoy your time together at the resorts made for love. Inspired by the beautiful traditions and majestic backdrops of the Caribbean, Red Lane® Spa experiences focus on connection, time and love. Indulge in European-style massages, facials, body wraps, scrubs and more while surrounded by the beauty and soothing island rhythms of the Caribbean. Golf along an emerald fairway overlooking the sea at Sandals Golf & Country Club, where the play is unlimited and green fees are included. Golf Digest gave this Par 71 course its 4-star rating, and it's easy to see why. Enjoy a driving range with a chipping and putting green, and complimentary transportation to and from the course. The best way to experience the real Jamaica is to get up close and personal with it. Island Routes offers luxury adventure tours that range from completely exhilarating to delightfully sedate. Discover the lush beauty, incredible spirit and thrilling activities offered along the Caribbean Riviera. Sandals Royal Plantation is an intimate, all-butler resort of just 74 oceanview suites tucked into a magnificent coral bluff. At Sandals Royal Plantation, 5 extraordinary restaurants offer tantalizing temptations. From French cuisine to Italian favorites and authentic pub fare, impeccable service, mouthwatering international cuisine, and a romantic atmosphere are found everywhere. No other all-inclusive in the world offers fine caviar available at the Caribbean's finest and Jamaica's only Caviar + Champagne bar*. We also have a vast wine cellar of international quality and choice. All wines have been specially selected by our highly experienced resident Sommelier to delight even the most refined and discerning palates of connoisseurs. * Caviar and certain wines are available at an additional charge. You know you've arrived when you meet your own personal butler. Trained in accordance to the exacting standards by the Guild of Professional Butlers (they're the ones who provide butlers to nobility and celebrities), your butler handles every detail of your vacation with unobtrusive grace. Give yourself the perfect golf vacation, with rolling fairways lined by sweeping views of the sea and mountains. This magnificent 18-hole course rises 700 feet above sea level in the lush hills of Ocho Rios, with a practice range, putting and chipping greens, pro shop, restaurant and snack shack. Complimentary transfers always included. Round-Trip Transfers from Kingston Airport (KIN) to all Sandals Resorts in Jamaica are included.